Though there is a natural limit to the amount of red meat we should eat to optimize our personal health, this amount is not zero. This is especially true when it comes to lean and sustainable grass-fed meats, and when our meals are made the HumanaNatura way and following HumanaNatura’s OurPlate healthy eating guidelines. In the HumanaNatura approach, regular meals with red meats can be served, ones that will be healthy and satisfy your urge for a hearty meal. This satisfying, red meat-using salad meal starts with a big bed of arugula and adds julienne cucumber, diced kiwi, and mixed cherry tomatoes. It adds a sauté of cubed beef and red onion, cooked while preparing the salad base and mix. And it then is garnished with parsley, marjoram, coriander, and red and black pepper. A fast, delicious, and healthy way to satisfy a big appetite…as always, when you prepare your meals the HumanaNatura way! Learn more about creating naturally delicious and optimally nutritious meals via OurPlate, HumanaNatura’s simple optimal eating guide and meal rating tool. And experience how this science-based and 100% natural approach to our daily meals can change the way you eat, feel, and live. Perfect your skills at making delicious and naturally healthy salad meals that follow the OurPlate guidelines via the Meals tab above, our popular article Perfect Salad Meals, or the Natural Eating section of our comprehensive Personal Health Program. Tell others about HumanaNatura…promote new life and health! Greetings from HumanaNatura at the cross-quarter! In the natural year, we are now halfway between the extremes of light and darkness of the past solstice and the more naturally balanced time of the coming equinox. 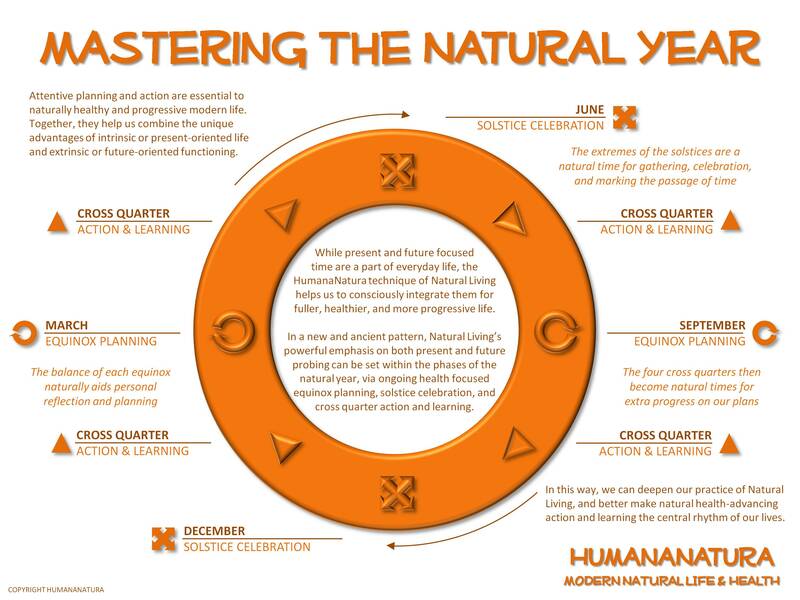 In the HumanaNatura approach, and as explained in our Mastering The Natural Year post and graphic, we encourage extra progress on our Natural Life Plans around the cross-quarter, so that we have adequate completed actions and learning at the equinox – in another six weeks or eighth of a year – when HumanaNatura encourages plan review and renewal. If you have not yet created a Natural Life Plan to guide your use and expression of the third HumanaNatura technique, Natural Living, our links will take you to our planning worksheets and seven-step planning process. Together, these resources will help you begin more intentionally health-centered and naturally progressive life in the days and weeks ahead. Our newest member newsletter was released today as well, which is published eight times yearly in harmony with the natural year, providing updates on HumanaNatura’s resources, programs, and worldwide health campaigns. To receive future HumanaNatura newsletters or learn more about our global practitioner-advocate network, go to Join HumanaNatura. Tell your friends about HumanaNatura…promote new life and health!